Friday 19. For the last two weeks I have been trying to get Charles Strutz home, who is sick at Duck Port La. 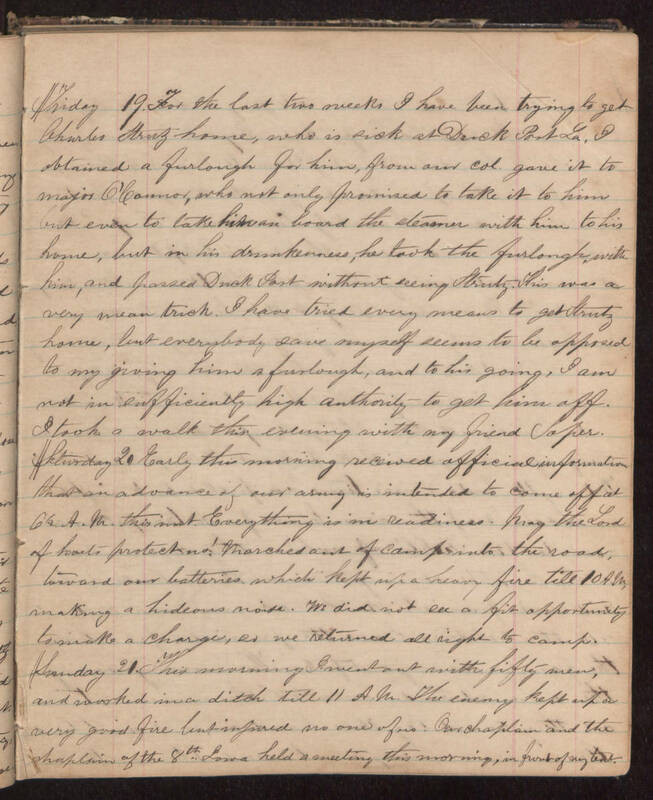 I obtained a furlough for him, from our Col. gave it to major O’Connor, who not only promised to take it to him but even to take him on board the steamer with him to his home, but in his drunkenness, he took the furlong with him, and passed Duck Port without seeing Strutz. This was a very mean trick. I have tried every means to get Strutz home, but everybody save myself seems to be opposed to my giving him a furlough and to his going. I am not in sufficiently high authority to get him off. I took a walk this morning with my friend Soper. Saturday 20 Early this morning received official information that an advance of our army is intended to come off at 6 ½ A. M. this inst. Everything is in readiness. Pray the Lord of hosts protect us! Marched out of Camp into the road, toward our batteries which kept up a heavy fire till 10 A. M. making a hideous noise. We did not see a fit opportunity to make a charge, so we returned all right to camp. Sunday 21. This morning I went out with fifty men, and worked in a ditch till 11 A. M. The enemy kept up a very good fire but injured no one of us. Our chaplain and the chaplain of the 8th Iowa held a meeting this morning, in front of my tent.